HEY WATCH IT !!! I don’t want your GERMS!!! Catch a sneeze in the crook of your elbow. Sneezes are a sure way to spread germs quickly. 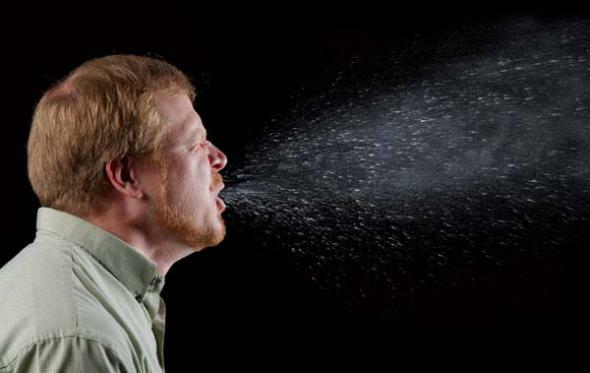 A seemingly innocuous sneeze sends germs flying through the air. Even though you can’t see them, they are launched out where everyone can breathe them in. It is good to cover your mouth when you sneeze or cough, but there are a couple of ways to do it that will be less likely to spread germs from you to someone else. It’s a good thing to teach kids, too. If you feel a sneeze coming, get ready. Using your hand is better than letting it go out into the air but not the best way to keep from spreading your germs. Once the sneeze or cough is on your hand, then what? Chances are you may not be near a bathroom if you are out in public so that you can wash your hands. So you end up touching surfaces of things that other people will then come along and touch, or you may touch another person directly. Either way, you just passed along what you carefully tried to cover up with your hand. Kids are notorious for touching everything, so imagine how easily they spread or receive germs when they are around each other. Use your shoulder instead when you have to sneeze or cough. Bend your shoulder and turn your face toward your shoulder to sneeze, covering your mouth completely but not blocking the air flowing out completely. If you block a sneeze or hold your nose, you can damage your ears. There has to be some way for the sneeze to release itself. When you sneeze or cough into your own shoulder, you are far less likely to be touching something and spreading your germs. Nin Jiom Pei Pa Koa (ninjiom-hk.cwahi.net) may be another solution to cough. i know a lot of people use it, its also non alcoholic, though it’s effectiveness is not as good as alcohol based cough medicine, but it’s still good to use on not so serious cough and sore throat.